This precious book contains all the sermons, articles and book reviews on this vital subject by one of the most brilliant theologians America has ever produced. Sinclair Ferguson, author and pastor, said, "I commend these pages, as one who has continually been helped by their contents. It is a treasure to be enjoyed again and again." Joel Beeke added, ""These ... show the genuine stamp of Reformed experiential piety that rested on the great 19th-century Princeton theologians. The sermons on the leading and sealing of the Spirit are themselves worth the price of the book. Would you like guidance in learning how to live more closely to Christ, how to walk more by faith through the Spirit, and how to wrestle at the throne of grace? Read this book prayerfully, both for clarity of mind and warmth of soul with regard to the person and ministry of the blessed Spirit. Let Warfield be your spiritual mentor in the great things of God." 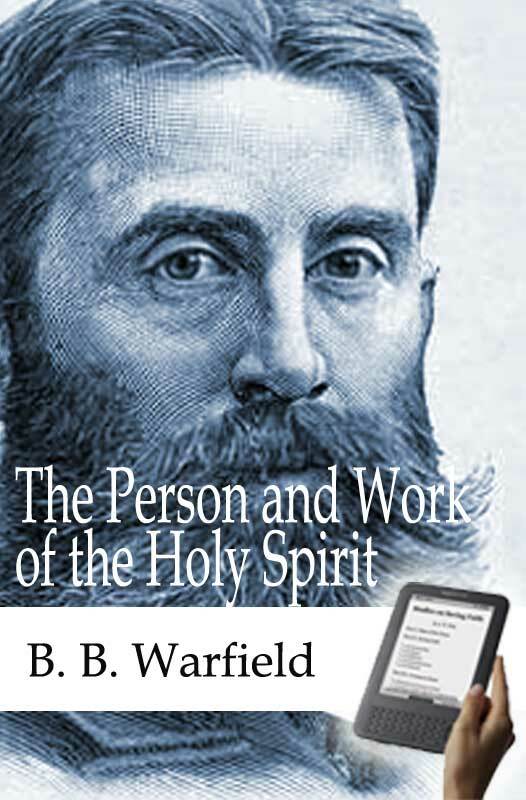 Warfield’s expositions of the person and work of the Spirit span the whole spectrum of the theology of the Spirit. Warfield does not deal with key doctrines of the Spirit as Author of Scripture (available elsewhere), the baptism in the Spirit, or the fruit and gifts of the Spirit. But the subjects of which he does treat offer us the very best exposition and devotional application. This title originally aggregated and sold by Solid Ground Christian Books. An exposition of Ps. 51:12 and the restoration of the joy of salvation. Warfield contends that the “wonderful depth of the religious experience and the remarkable richness of religious conception embodied in this Psalm” are distinctively Christian ideas revealing the work of the Spirit in the hearts of OT saints: the conception of God as a God of righteousness, the profound sense of sin, a God of grace and lovingkindness, and the radical nature of deliverance of sin that is required for us. These are all associated with the work of the Spirit. “The operations of the Holy Spirit in the sphere of the moral life, the ethical activities of the Spirit, His sanctifying work, are but little adverted to in the Old Testament, and when alluded to, it is chiefly in promises for the Messianic period. Here, David not merely prays for them in his own case, but announces them as part of the experience of the past and present. His chance of standing, he says in effect, hangs on the continued presence of the Holy Spirit of God in him…” The Spirit is at the heart and in the heart of God’s work in saving sinners in that period. In this chapter we make the official transition from the old to the new by the official coming in the pouring out of the Spirit. Warfield once again asserts the truth that needs to be thundered forth today that “The Spirit was active under the Old Testament in all the modes of His activity under the New Dispensation.” Here is a helpful treatment of Pentecost as it occurred in the history of salvation. We so often think of the leading of the Spirit as consisting of holy impressions or convictions that lead us in a certain direction. The expression “the Spirit led me” to do or say this or that is so often a trite excuse for our own self-will. The leading of the Spirit relates to our relationship to the Law of God and the ethical life of the Christian. The foundational texts are Romans 8:14 (“For as many as are led by the Spirit of God, these are the sons of God”) and Gal. 5:18 (“If you are led by the Spirit, you are not under the law”). Warfield points out that the leading of the Spirit is a subject of which Christians have formed inadequate conceptions which are positively erroneous. These faulty expressions often have the flavor of fanaticism and spiritual extravagance. Paul is speaking of our ability to conquer sin and fighting the good fight of faith. He gives an extensive treatment of the manner of the Spirit’s leading which he relates to 2 Pet. 1:21 and the way which the Spirit carried (borne along) the authors of Scripture to speak the word of God. So the Spirit carries us, leads us and guides us in the way of ethical holiness. Excellent! In Rom. 8:16 we learn that the Spirit bears witness with our spirit that we are children of God. This testimony of the Spirit is not to be confused with the testimony of our own consciousness. It is rather the divine witness in us and to us. “The whole sense of Paul’s declaration is that we have, over and beyond our own authority, a divine witness to our sonship to God on which we may rest without fear that we shall be put to shame.” Is this witness syllogistically determined or mystically determined? Is it determined by rational argument, or by the immediate whisper of the Spirit to our hearts? What is the mode of the delivery of the Spirit’s witness? He makes a convincing case for a dual delivery of this witness both to the heart and to the mind. This sermon on 2 Corinthians 6:11-7:1 could be a fitting conclusion to all of Warfield’s sermons and articles on the Holy Spirit in a rearrangement. In this passage Paul is urging us to a life of separation from evil. We are to come out from among men and be separate, i.e., holy. It is the Holy Spirit whom we possess. “The Apostle’s urgency here is against, not association with the world, but compromise with the worldly.” The fundamental dichotomy that distinguishes people in the world is whether or not they possess the Holy Spirit. This sermon then, is a stirring appeal to us to understand the full-orbed work of the person of the Holy Spirit and walk in Him in a life that is pure and holy just as He is. Warfield points out that spiritual strengthening is identical with the abiding of Christ in our hearts, as taught in Ephesians 3:14-19. Paul is not praying that his readers will be converted, but that they already have Christ abiding in them. It is in this sermon that Warfield comes closest in his writings to showing the relationship between Christ and His Holy Spirit. He says “But he has read his New Testament to little purpose who would separate the Holy Spirit and Christ: Christ lives in the heart by the Spirit. The indwelling of the Holy Spirit is the means of the indwelling of Christ, and the two are one and the same great fact…..Christ is the ultimate source. His indwelling is the ground of all our strength. But it is only by the Spirit – the executive of the Godhead in this sphere also – that Christ dwells in the heart.” This is the objective fact, but Warfield speaks also of a subjective fact in our strengthening which is our faith: “That Christ may abide in your hearts by your faith…” So the sources of Christian strength are Christ in the heart by the Spirit quickening and upholding faith in us. The two cannot be separated, and thus Warfield says “this is the proximate end of the prayer: expansion of heart for the apprehension of spiritual things.” The intermediate step between the work of the Spirit and our faith is love. “The proximate effect of the Spirit’s work in empowering the inner man with might is not knowledge, but love; but the proximate cause of our enlarged spiritual apprehension is not the strengthening of our inner man, but love… love is the great enlarger. It is love which stretches the intellect…” And there is one further step which the author notes, that is that we may be filled up to the whole fullness of God. The sermon concludes with a grand finale showing us the height of attainment that comes to us in the enlargement of our souls by the Holy Spirit. Titus 3:4-7 demonstrates that our salvation is the work of the washing of regeneration and renewing of the Holy Spirit. God is our Lover, Christ is our Redeemer, and the Spirit is our Sanctifier. When we scrutinize the work of the Spirit we see a “complete order of salvation:……the Spirit works by first regenerating the soul, next justifying it, next adopting it into the family of God, and the next sanctifying it.” The practical fruit of this teaching is that we are to walk in the way of maintaining good works, and that we are saved not out of works but unto good works. There is no violent discontinuity as we pass from the OT to the NT in our conception of the Spirit. He is the Executive of the Godhead in both. Warfield’s treatment of the Spirit in the OT is a comprehensive overview. Every text is not dealt with, but every major concept is. Here is a magnificent treatment of: The Cosmic Spirit – His work in creation and providence; The Theocratic Spirit – His work in redemption among the nation Israel; The Personal Spirit – His personal ministry of saving and indwelling OT saints.